Sony PlayStation Game published 19 years ago by Xing Ent. 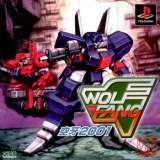 Wolf Fang - Ku-U-Ga 2001 © 2000 Xing Ent. Released on December 07, 2000 in Japan.